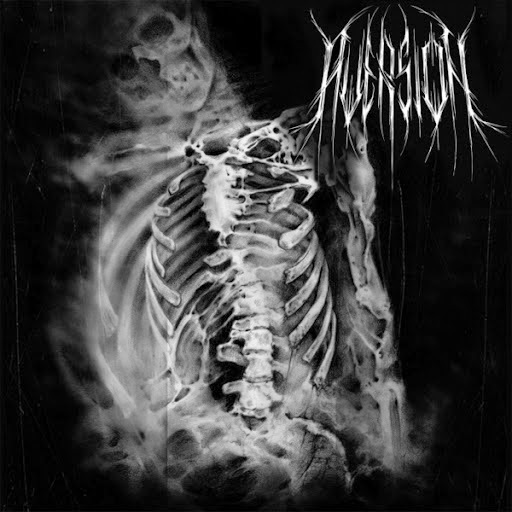 Aversion is a band formed in 2011 in Montreal, Quebec in Canada, they started as a three piece band consisting of Max Macabre on drums, Vena Kava doing vocals and Nemrod on guitars, this is how they began to write songs for their "Pre-life Nostalgia" demo released in 2013, the current line-up is complemented by Vilain taking on drums and Max Macabre moved on guitars and the bassist Leather King, Aversion plays a Black metal with Thrash influences. The debut album self titled with a production very raw and visceral at moments, gives an early sound of the second wave of Black metal the opening track "Espoirs Brisés" fall into a blackened crust sound the guitars are corrosives remind me the Brazilian band Sarcofago, "Flesh of the Maggot" is more slow paced with a depressive melody, "Pre-life Nostalgia" comes from their first demo as well as "Gangrene Harvest" which closes the album, both were described early for nataliezworld.com in an interview with Vena Kara she comment: "Both songs have a more defined sound and more representative of the direction were heading toward then" http://tinyurl.com/qa8wqdb "Sacrifice" this is the longest track in this album, reaching barely the five minute mark, also comes to be the most melodic and brutal, here you can appreciate the full potential this band has, however after this cut it feel like they just packed up almost ten minutes of generic black metal which really hurt the balance they have been crafted with the previous tracks, but fortunately "Gangrene Harvest" comes to save this album, excellent change of tempos melody and brutality meet again in a unique piece a guitar solo that blends perfect to end the song, Vena Kava does an impressive job delivering strength and passion with her growling vocals. Despite the production which is not very clear, but focus in the primary elements of their song writing, it helps somehow to define the sound of Aversion as a raw, heavy and brutal bringing an old and refreshing air to this scene that is so saturated, I really encourage you to listen to them, you never know! You might find an enjoyable surprise.